Tendinopathies are commonly seen in athletes such as volleyball players, can be seen in athletes at all levels of competition, but seem to be most prevalent in jumping athletes. 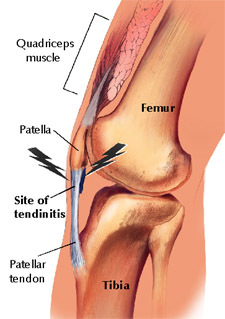 “Athletes whose sports involve repetitive sudden ballistic movements of the knee may develop anterior knee pain associated with tenderness at the inferior pole of the patella.”3 These repetitive ballistic movements result in microtrauma to the tendon due to the extreme forces that occur during acceleration, deceleration, jumping, and landing. “A higher prevalence is noted in sports with high impact ballistic loading of the knee extensors.”4 Factors thought to contribute to a patellar tendinopathy include strength imbalance, postural alignment, foot structure, reduced ankle dorsiflexion, lack of muscle strength and flexibility, increased physical load, increased repetitions, increased intensity, and increased training duration. Prognosis depends on the type of injury. An acute tendinitis can be expected to resolve relatively quickly while a chronic tendinopathy can take much longer. Evidence in the literature states that the prognosis can vary depending on the patient from 6 weeks to 6 months depending on the degree of degenerative damage. 1. Jensen K, Di Fabio RP. Evaluation of eccentric exercise in treatment of patellar tendinitis. Phys Ther. 1989;69(3):211-216. 2. Wilson JJ, Best TM. Common overuse tendon problems: A review and recommendations for treatment. Am Fam Physician. 2005;72(5):811-818. 3. Khan KM, Maffulli N, Coleman BD, Cook JL, Taunton JE. Patellar tendinopathy: some aspects of basic science and clinical management. Br J Sports Med. 1998;32(4):346-355. 4. Rutland M, O'Connell D, Brismee JM, Sizer P, Apte G, O'Connell J. Evidence-supported rehabilitation of patellar tendinopathy. N Am J Sports Phys Ther. 2010;5(3):166-178. 5. Woodley BL, Newsham-West RJ, Baxter GD. Chronic tendinopathy: effectiveness of eccentric exercise. Br J Sports Med. 2007;41(4):188-198; discussion 199. Epub 2006 Oct 2024. 6. Cook JL, Khan KM. What is the most appropriate treatment for patellar tendinopathy? Br J Sports Med. 2001;35(5):291-294. 7. Young MA, Cook JL, Purdam CR, Kiss ZS, Alfredson H. Eccentric decline squat protocol offers superior results at 12 months compared with traditional eccentric protocol for patellar tendinopathy in volleyball players. Br J Sports Med. 2005;39(2):102-105.